Flounder are a year round species on both the inshore flats and Atlantic Ocean, but are typically targeted during their seasonal spawning migration through the inlet passes when concentrations are heaver. Two species of flounder (Southern and gulf) are available in our coastal waters and both make excellent table far. 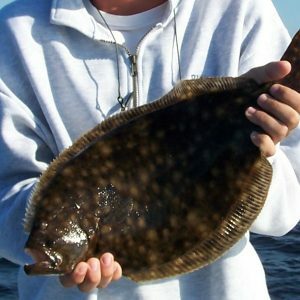 Flounder are bottom dwellers so tactics utilized focus on working both lures and bait on the bottom.